Ah, latex masks. Halloween and horror movies simply wouldn’t be the same if they didn’t exist. In fact, it was once thought that such masks could replace makeup entirely! But although many of us drool over such masks, sometimes the price of one is scarier than the creature it depicts. The MonsterMakers: How to Make a Monster! 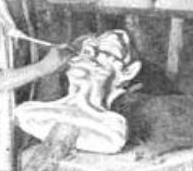 Pages 14-21 of the Google Books preview for The Monster Makers Mask Makers Handbook by Arnold Goldman also give some great mask-making tips. After you finish making your own latex masks, you’re going to need to know how to store and care for them. Thankfully, the Mask Dr has a handy online guide available. Or if all that seems too complicated and time-consuming for you, there’s always paper masks. As noted in yesterday’s “How-To” post, Gravedigger’s Local 16 is not to be held responsible for the content on or anything that may occur (be it good or bad) as a result of visiting any links on those sites (or constructing a project that’s detailed on them). Attempt at your own risk.